What is Special about the Hematite Stone? For centuries, magnets have been used by many different cultures in the belief that they have a positive effect on the healing process. There is an increasing amount of anecdotal evidence that magnetic therapy can be helpful. Many health professionals use magnets for improving the health of their patients particularly recommending that their patients use magnetic bracelets to help reduce pain. They claim that the magnetic field that’s generated by the magnet can bring the metabolic functions of a specific part of the body back to normal. It’s believed that it works because the jewellery increases the blood flow, and oxygen that’s circulated to a given area. It can then treat a variety of medical conditions that bring about pain or inflammation. Additionally, we all suffer from insomnia or disturbed sleep patterns at some point. Magnetic jewellery is believed to ease the stress and tension of daily living and aid sleep. People who wear magnetic jewellery believe their medical conditions are improved. These conditions include general aches, ankle pain, anxiety, arthritis, asthma, back pain, bronchitis, carpel tunnel syndrome, circulation problems, digestive problems, fatigue, gout, high blood pressure, headaches, insomnia, joint pain, knee pain, lack of energy, migraine, muscular problems. Phlebitis, period pains, respiratory problems, rheumatism, sciatica, stress, tendonitis, tiredness, tennis elbow, torn ligaments, wrist pain, varicose veins. Not only do the claims make people wear the magnetic jewellery, but they also look good and many people wear them simply for this reason. After surgery, because magnets may interfere with the healing process. Also please keep magnets away from other electrical appliances such as televisions, computers, computer discs, cassettes and credit cards, as their magnetic fields may interfere which each other. 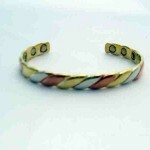 Which is the right type of bangle or bracelet for you? 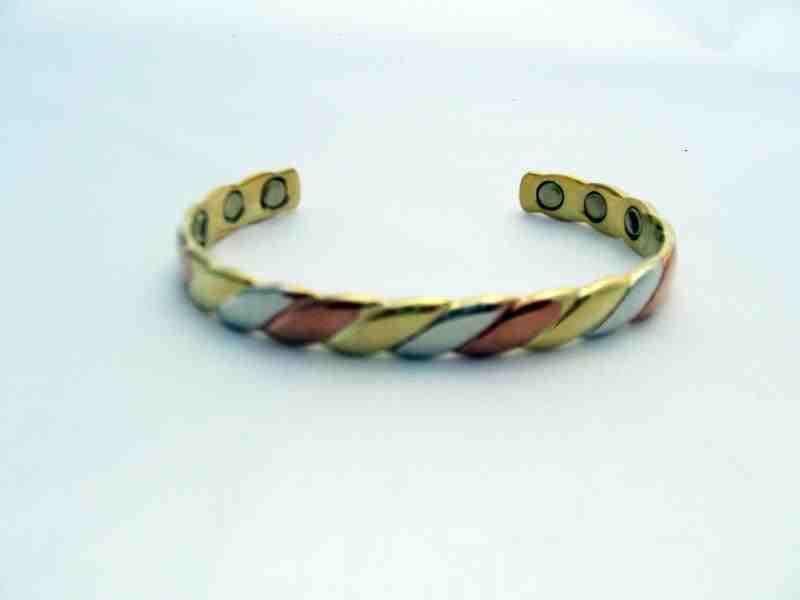 A copper magnetic bangle has the extra benefit of being especially good for those who suffer from arthritis and rheumatism but they are not recommended for people with sensitive skins and they should not be worn in water because this leads to discolouration. Copper is an essential mineral necessary for pain relief and to assist the body in the production of white blood cells to fight infection. Wearing a copper bangle will leave green/black residue on your wrist which is evidence that the copper is being successfully absorbed. 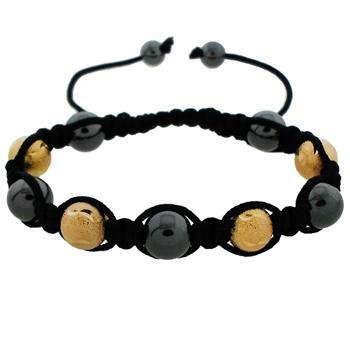 Stainless steel bracelets are hypo-allergenic and therefore suitable for those with sensitive skins and they can be worn in water without damage for anyone who wishes to wear them all the time. Humans have been producing and adorning themselves with jewellery for a long time. 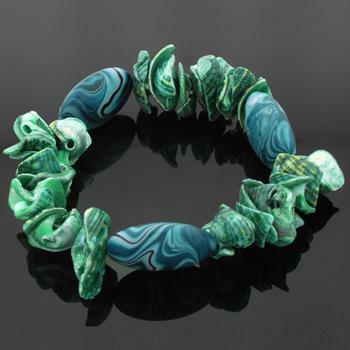 In fact, 100,000 year-old beads made from Nassarius Snail shells are thought to be the oldest known jewellery. These ancient shells can be found in The Natural History Museum. The Nassarius shell looks like a beautifully textured oval bead. Vestiges of red ochre and holes in unnatural places suggested that the fossilized shells were strung on string or other fibrous material to form a necklace. Nice to see that even today, we have beautiful shell jewellery available in all shapes and colours and that maybe in a further 100,000 years time, Historians will be writing about them too. It is believed that hematite has a very strong grounding energy and at times, you can feel that just by holding the stone in your hand. Also that is has a cooling and calming effect and helps develop concentration and focus. Hematite is accredited to bring a quality of energy that is powerful, strong and grounding, working with one’s mind by calming it and clearing the unnecessary clutter. I think we could all do with a bit of that! One thing for sure though, having hematite beads creates beautiful jewellery and if they help with energy and health, it’s a real bonus. Hematite is an iron ore that is a dark grey colour and a little shiny looking. 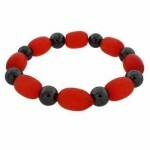 It is a pretty, common stone which is why hematite beads are often used in jewellery. 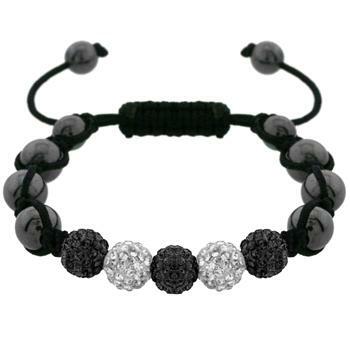 Magnetised Hematite Jewellery is said to alleviate back pain, joint pain, chronic pain, muscle pain and arthritis. Many claims have been made about the healing properties of Hematite and making it into jewellery is one way of keeping this remarkable stone close to you to aid in any healing that may be derived from it. Hematite stone is primarily found in the United States, Brazil, Venezuela, and Canada. The name hematite comes from “hema” in Greek, meaning “blood” and although shiny and black on the outside, if you see particles from this stone when cut, they are a dark red colour. Another reason for it’s name might be related to the high iron content found in hematite (almost 70%), which made hematite a popular healing stone for blood-related disorders. Hematite has long been used as an aid to healing and has a wide variety of healing properties ascribed to it, including relief from leg cramps and alleviating fevers. The best way to find out the powers of hematite is to buy a stone and experiment yourself. Welcome to the La Shack blog. In the coming months we will be bringing you all kinds of news, information and articles on jewellery and gifts that we hope you will enjoy. Please keep checking back to this blog for news and information. We hope that you will enjoy our articles and that you will be entertained and informed.